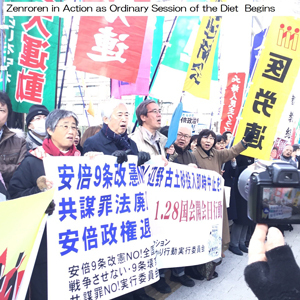 On January 28, as Japan’s National Diet opened its 150-day ordinary session, 450 workers and citizens had a day of action. They were from the National Confederation of Trade Unions (Zenroren) and coalitions of citizens groups, including the National Citizens’ Action against Adverse Revision of the Constitution’s Article 9, the Organizing Committee for All-Out Action, and the Organizing Committee against the Anti-Conspiracy Laws. Participants together expressed their determination to stop a process of constitutional revision from being initiated, to help parties that defend constitutionalism win in the upcoming House of Councilors election, to bring success to Okinawans’ referendum to stop the plan to construct a new US base in the Henoko district of Nago City, Okinawa, and to put an end to the government of Prime Minister ABE Shinzo in the current session of Diet. Leaders of opposition parties joined the action to express solidarity with union workers. Speakers included FUKUSHIMA Mizuho of the Social Democratic Party, KOIKE Akira of the Japanese Communist Party, OHSHIMA Kusuo of the Democratic Party for The People, EZAKI Takashi of the Constitutional Democratic Party, and IHA Yoichi of Okinawa Whirlwind. The 198th Ordinary Session of the Diet opened today (January 28). The task is for us to demand and win a government budget that puts workers’ and people’s livelihoods first and to prevent the Liberal Democratic Party from submitting its draft of a revised Constitution to the Diet. The government is proposing a national budget that exceeds 100 trillion yen for the first time. But money for social services is reduced by 120 billion yen as people are forced to pay 61 billion yen more for nursing care insurance contribution and livelihood assistance payments are being lowered. In addition, the budget plan counts on 5.7 trillion in revenue from the consumption tax, which is expected to be increased. This way of drafting a budget amounts to relinquishing a government role in income adjustment. It’s totally unacceptable. Forcing people to pay more in nursing insurance contribution means cuts in disposable earning on the part of workers and people in general. A consumption tax increase means widening income inequality. The government plans to introduce “social security with the support of all generations” and reduced consumption tax rates for certain goods and services when its rate is increased. But reduced consumption tax rates will only widen the income inequality. Under a social security system supported by all generations, while the burden of households of strata capable of paying high fees for child care services will be reduced, the needy will enjoy no such benefits. The reduced rate system that the government is considering is not only complicated. It will also benefit consumers who buy high priced goods or services. The government policy does not reflect the actual state of people’s livelihoods. “Defense” spending should be cut by 5.3 trillion yen. Japan is continuing to buy weapons, which include weapons for space war or invasion abroad, apparently to accede to the demand of the US government and Japan’s business circles. The government bases its arms purchases on the same understanding of the situation as three years ago without taking into account the changes that are now underway in North Korea. This way of arms procurement is clearly changing the meaning of “national defense”. It will also further worsen the country’s fiscal position and making it difficult for the people to make ends meet. We will expose the truth of these issues as they are discussed in the Diet. The struggle to stop the consumption tax rate from being raised in October is crucial. We will increase the combined parliamentary and extra-parliamentary forces and joint struggle between the citizens’ movement and opposition parties to win the enactment of a national budget that truly benefit the workers and the people in general. “Accurate data and information” are prerequisite for parliamentary discussions. It was extraordinary that the government bill for the FY2019 budget had to be approved by the Cabinet again on January 18 following the revelation of the falsification of the findings of the Health, Labor and Welfare Ministry’s monthly labor force survey. We must not overlook the fact that the Cabinet of Prime Minister Abe knew the irregularities in January. The Health, Labor and Welfare Minister cannot escape the responsibility for endorsing the budget bill at the Cabinet meeting. The irregularities have been discovered in 22 out of 56 key government surveys. The government should unravel every aspect of all its surveys to pave the way for deliberations in the Diet. To that end, it is necessary to increase the numbers of surveys and of channels of survey. The Prime Minister is duty-bound to defend the Constitution. 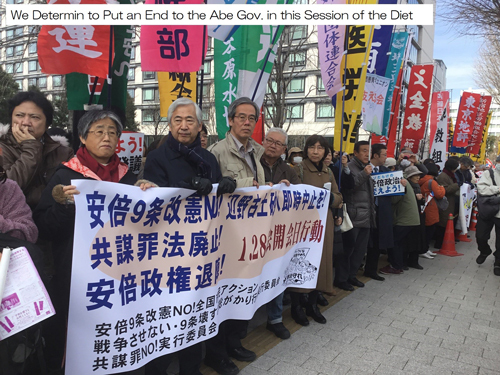 But Prime Minister Abe used his policy speech in the Diet to call for discussion on constitutional revision. He does not understand his being duty-bound to defend the Constitution and the principle of the separation of powers, division of the legislative, executive and judicial functions of government. He has no right to call for constitutional revision. Even some LDP politicians are saying “it’s difficult to get the Constitution revised at the call of Abe”. What Abe has in mind is to adversely amend Article 9 of the Constitution to pave the way for turning Japan into a country that wages war. That’s what we must reject for any reasons. We should be convinced of what we have achieved so far in the 30-million signature campaign in each federation and region. Continuing to raise the level of the effort, we will increase our movement with the nationwide local elections and the subsequent House of Councilors election in mind.